Brig. Gen. Lorna Mahlock, former deputy director of plans, policies, and operations at the U.S. Marine Corps‘ headquarters, has taken a new role as the service branch’s chief information officer, FCW reported Friday. 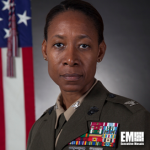 She will concurrently serve as director of command, control, communications and computers at USMC. Mahlock succeeds Kenneth Bible, who has held the CIO and C4 deputy director roles on an acting basis after Brig. Gen. Dennis Crall stepped down earlier this year. She joined USMC through the service branch’s Enlisted Commissioning Education Program in late 1991 after immigrating to the U.S. from Jamaica and has held leadership positions across various levels globally such as commanding officer of Marine Air Control Group 18 in Okinawa, Japan. She holds Federal Aviation Administration certifications as a tower local controller and a Marine aviation weapons and tactics instructor. 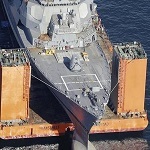 Tags c4 Chief Information Officer CIO Dennis Crall featured Federal Aviation Administration govcon Japan Kenneth Bible Lorna Mahlock U.S. Marine Corps.